Kirkland Signature Glucosamine and Chondroitin Review | Does It Work? 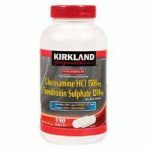 Kirkland Signature Glucosamine and Chondroitin Review – Is This Product Safe To Use? People who are suffering from arthritis or arthritis related ailments. Persons who are looking to maintain their joints even when they age. What is Kirkland Signature Glucosamine and Chondroitin and Company BehindKirkland Signature? Glucosamine – Glucosamine production in the body reduces as they age. It is believed to promote formation and cartilage repair. Chondroitin Sulphate – It promotes lubrication of joints as it is hygroscopic. How Kirkland Signature Glucosamine and Chondroitin Works? The producers designed it to be a joint support ingredient. This means that this product doesn’t give you instant relief to pain or anything but instead, it makes the body ready to fight the agents that bring pain to your body. The first product used in this product is glucosamine. Glucosamine is perhaps one of the most sort after joint ingredient. It plays a critical role in the repair and rejuvenating of damaged joints and cartilage. Cartilage is the compound that keeps your joint strong and your connective tissues working. The second ingredient is chondroitin. This is a highly hygroscopic compound that plays both the role of lubrication and repair. In some studies, researchers have suggested that it can also fight inflammation. Due to its hygroscopic nature, chondroitin is able to attract fluids into joints leaving them hydrated and lubricated. The recommended dosage is two tablets daily or as instructed by your caregiver. It is not stipulated whether you should take it as a single serving or two separate servings but it is better to take it as two separate servings. Take lots of water while taking this product. It is made using all natural ingredients that are tested and proven safe. There are no known side effects associated with this product but this doesn’t rule out the possibility of allergic reactions. If you are allergic to any of the ingredients mentioned above, proceed with caution or seek help from your caregiver. This also applies to people with serious medical conditions or people taking other medications. Is Kirkland Signature Glucosamine and Chondroitin a Scam? It is not a scam. This is a legitimate product by a reputable company that works well when used for the intended purposes and recommended way. It is without doubt a good product on paper. It comes with two of the most sort after ingredients in joint care. Nevertheless, the producers fail to make it competitive by failing to include essential vitamins and minerals such as calcium that are known to strengthen the bones. We believe that our site features better products than Kirkland Signature Glucosamine and Chondroitin.